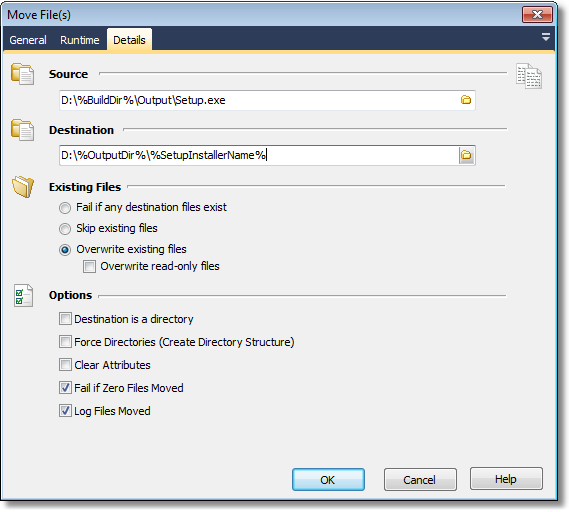 The Move File(s) action will move a File or a set of files that match a file spec to the destination file or directory. You can use wildcards in the source setting to move more than one file (the "Destination is a directory" property will be set automatically). If the target directories do not already exist, check the Force Directories property to make FinalBuilder create the directories as needed. If any file fails to move, then the action will fail. The Copy/Move FileSet action provides more sophisticated support for choosing files to move. If a file already exists at the destination, select how you would like the action to behave - fail, skip or overwrite. Destination is a directory - Set this option to indicate that the destination is a directory name, not a file name. Force Directories - If this option is set and the destination directory, or any parent directories, do not exist, then they will be created. Clear Attributes - If this option is set, the destination file will be created with all attributes (Archive, Read Only, Hidden, System) cleared. Fail if Zero Files Moved - If this option is set and no files are moved, the action will fail. Log Files Moved - Each file moved will be logged. If this option is not set, only skipped files or files with errors are logged. property FileSpec :WideString; // the file specification for the files to move. You may use Wildcards. property Force : WordBool; //Use Force Directories to create a directory and all parent directories that do not already exist. property ClearAttributes : WordBool // clear the moved file's attributes.